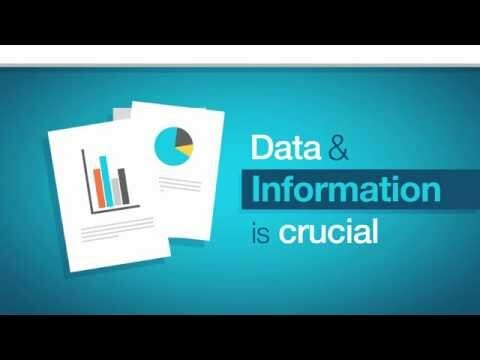 Every day businesses create more and more data. Data gets saved, employees move on, data is forgotten and lost. Valuable information that are sitting on the file servers and document stores, are not protected and are sometimes unrecoverable because no one knows where to find it. By classifying data businesses can retrieve more easily and identify more accurately the data that need to be protected. Data classification can reduce the risk of costly data leakage and increase the business efficiency. Data classification will help to regain control over all unstructured data. 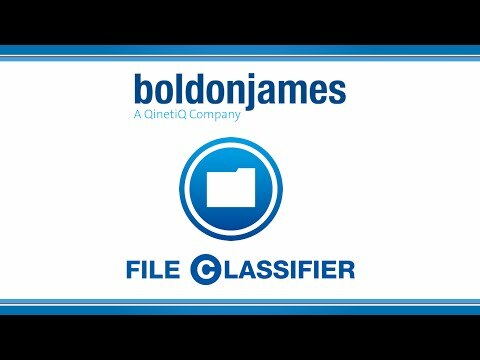 With Boldon James Classifier tools and the Automatic Classification platform Classifier360, the proper data classification approach can be selected, whether it be automatic classification, user-driven classification or a blend of classification techniques so that users are supported by the software with their classification decisions. By involving users in data classification, they will automatically become more data-aware, with a greater understanding of the company policies and the value of the organisation’s data. As well as the products identified above, the Foundation Suite also incorporates the benefits of the Classifier Platform, including the unified management console, common components and the comprehensive auditing of data classification activity. 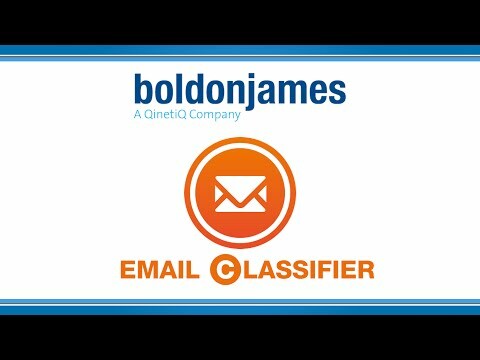 Email Classifier enables Outlook users to classify emails according to their sensitivity creating both a Visual and metadata label. Once labelled, data can be controlled to ensure that emails and files are only sent to those you want to receive them, protecting your sensitive information from accidental loss. Notes Classifier enables you to select classifications for your messages, then apply rules so that data can be marked and controlled according to its level of sensitivity. These rules include control over which data is shared with those outside of your organisation. Mobile Classifier allows you to separate out business and personal data, ensuring users correctly classify business data, making it easier to manage and protect. Windows Phone, Android, and iOS compatible, Mobile Classifier brings full classification support to the widest range of mobile devices and means you can benefit from your mobile workforce without the risk. As communication by email grows, more data loss is caused by user error than anything else. 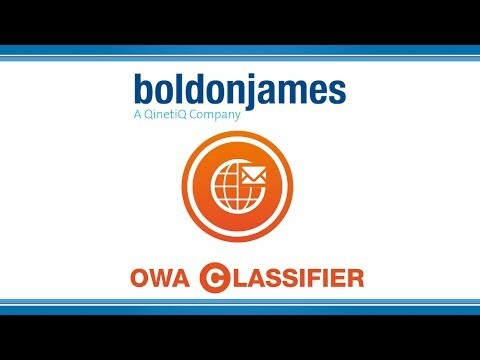 Using OWA Classifier all emails sent by Microsoft Outlook Web App can be classified and controlled in accordance with your data security policy. For example to ensure that users are warned when they try to send emails to recipients without the relevant permissions. Classifier Mail Add-In for OWA is designed to work with OWA 2013/16 or Office 365. Distribute your data on a ‘need to know’ basis. 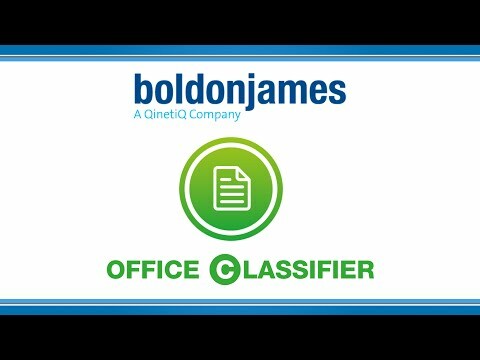 Office Classifier is unique in applying classification support to key Microsoft Office applications used in manipulating the unstructured data that holds so much of an organisation’s sensitive information – including Word, Excel, PowerPoint and unique to Boldon James – Visio and Project. You can be confident that your critical data is correctly identified and that your organisation has control. 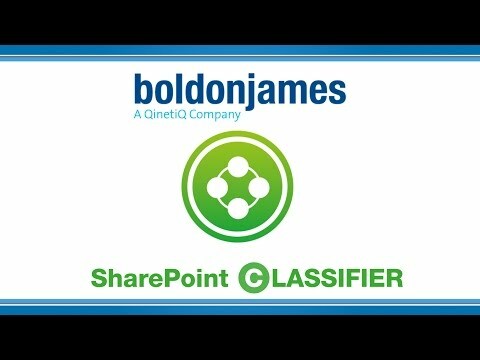 Classify data stored within Microsoft SharePoint using the familiar and intuitive interface provided by all Classifier products. A bulk document classifying feature enables you to classify large volumes of documents as they are uploaded to SharePoint quickly and efficiently. CAD Classifier brings the benefits of data classification to key design documents and CAD applications. You can apply relevant visual and metadata labels to Autodesk® AutoCAD® documents and receive guidance on labelling policy. In conjunction with Email Classifier, CAD Classifier can also ensure that such documents are only sent to appropriate departments or external organisations. 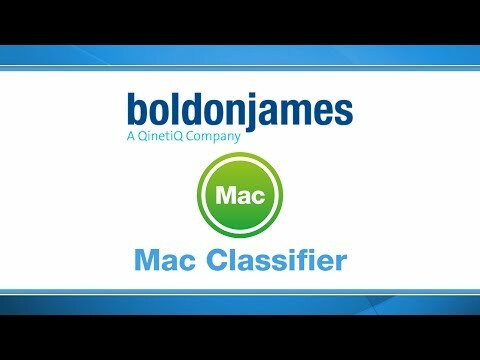 Boldon James Mac Classifier brings the benefits of user-centric data classification to organisations using Mac devices, supporting each user in correctly classifying documents and emails as they are worked on within the Microsoft Office for Mac applications. By attaching metadata classification labels to all of your data files you can control who sees them, who doesn’t, and who shares them. The intuitive drop down menu that sits within Windows File Explorer is configurable to reflect your own organisation’s data policies and enables users to select a classification level for each file quickly and easily. Other security tools are driven by the metadata label, ensuring they’re invoked when the data requires it, but data moves freely when it does not. 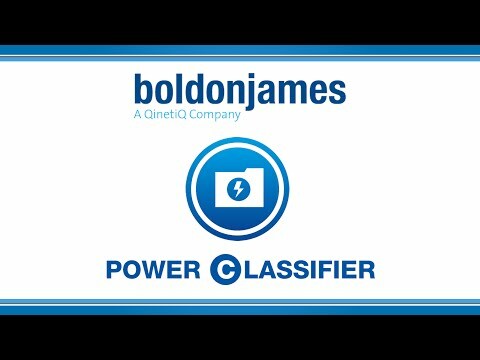 Power Classifier for Files makes light work of classifying large sets of existing information as well as automating routines to dynamically classify data at the point of creation; for example, classifying system generated reports. Power Classifier for Files gives you the confidence that all your data, both historic and new, is protected according to its value. Classifier Administration includes wizards to support administrators in setting up complex rules without the need to write lengthy syntaxes. A rich text editor enables intuitive and quick ways for administrators to amend notifications and visual markings. 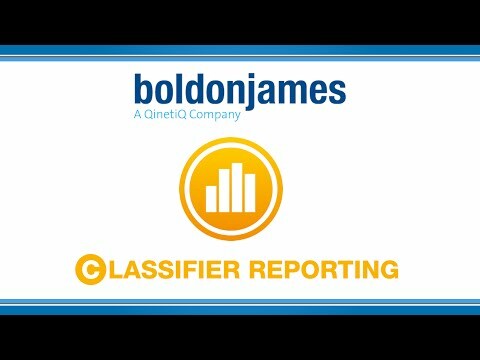 Classifier Reporting provides vital knowledge to management and compliance teams and enables more advanced analysis of user behaviour. It also provides integration options with a wide range of 3rd party analysis tools, including SIEM, Business Intelligence and advanced predictive analytics, to offer you superior insight and inform your security strategy. Mobile Filter detects messages deemed inappropriate for synchronisation and blocks them from the handheld device by monitoring the Exchange ActiveSync (EAS) synchronisation protocol and replacing identified messages. 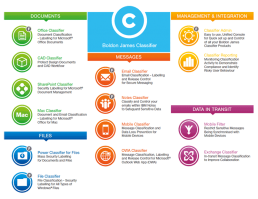 Exchange Classifier automatically applies your data protection rules and can apply appropriate visual and metadata markings to unlabelled messages. These rules are capable of determining who can receive sensitive data and directing the behaviour of your other data protection solutions. 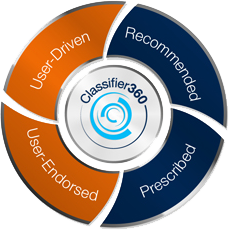 The Classifier Platform provides the architecture for delivery of the Classifier360 enterprise classification system, which blends together the best-practice classification techniques most appropriate to your business. Delivering unified policy administration across all Classifier products, the Classifier Platform enables the sharing of functionality between individual Classifier products and provides the means for customers and technology partners to rapidly integrate classification into their business processes and solutions. 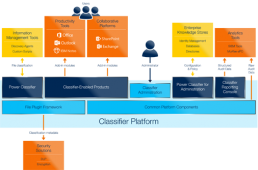 The Classifier platform is made up of a range of core components and optional products, such as the Power Classifier products and Classifier Reporting, each of which deliver the value of the underlying Platform in a convenient and accessible manner. Automated data classification involves the application of a classification for a particular file or message by a pre-defined rule set. The rule set might be based on matching keywords or expressions found in the content with a given list or identifying some other characteristic of the file for example it came from the customer information data store so needs to be protected. Automated classification can also extend classification coverage across a variety of originating data sources, including those which originate outside of user control. This approach is useful when organisations have data generated by automated processes or systems that should be classified at the point of creation without user intervention – for example reports that are produced by an ERP system. Some organisations look to combine automation with a user-driven approach to provide an element of support to the user. For example, applying default labels based on user group or department. This approach reduces the number of clicks that the user has to perform but by involving the user greatly enhances the accuracy of the classification process. 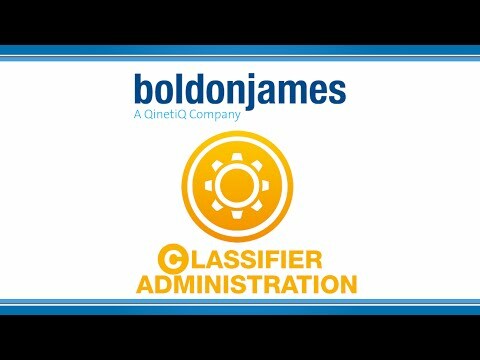 Boldon James Classifier360 is an Enterprise Classification System that blends together best practice in user-centric and automated classification techniques in the manner most appropriate to your business.